Cougars are big and nimble cats that have lengthy, trim bodies. The species has a vast home base that encompasses many parts of the Americas, from southerly South American locales all the way up to Canada. Cougars also are commonly called both pumas and mountain lions. Cougars' coats are usually brownish-gray, reddish-brown or yellowish-gray on top, with markedly paler tan coloring on the undersides. Their faces are also noticeable paler than the rest of their bodies, as their mouth regions are white. 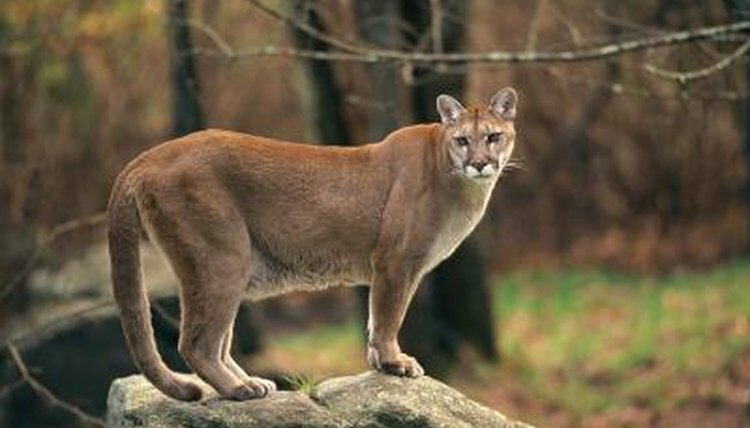 Fully mature male cougars (Puma concolor) are bigger than mature female cougars. The males usually weigh somewhere between 175 and 200 pounds, while the females usually weigh in the ballpark of 75 to 175 pounds. These mostly nocturnal cats tend to reside in many types of living environments, such as wetlands, mountains, grasslands, rain forests and deserts. If they live in areas close to people, they usually restrict their business to the wee morning or to just before nighttime. Although fellow cats such as lions frequently are associated with loud roaring, cougars, on the other hand, often make piercing and shrill screaming vocalizations. Cougars do not roar. The screaming sound is similar to that of a human female screaming, and male and female cougars alike are capable of it. It also is sometimes described as the sound of a wailing child or a pain-induced, suffering and miserable shriek. The cougar scream is linked to mating activities. In female cougars, it often is believed to be an indication of the heat cycle. Heat in cougars takes place at many points during the span of a year. When male cougar screams, it often is due to rivalry for the attentions of females. The spooky vocalization is prevalent when two -- or more -- male cougars have their sights set on the same female. Cougars also scream during mating. Screaming isn't the only type of sound that cougars make. Other vocalizations include purrs, hisses and chirrups. Youngsters frequently whistle at their mama -- a means of getting them to come over. Despite their many vocalizations, cougars are rather clandestine and silent creatures.